Home bitcoin crypto news Bitcoin Prices Blast Higher, But Why? Bitcoin Prices Blast Higher, But Why? 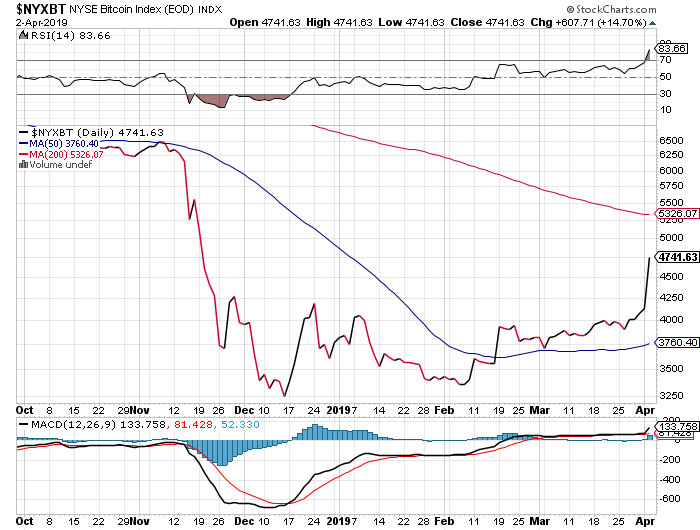 Over the last few days, Bitcoin prices smashed through their 200 SMA to the upside, but many market watchers want to know why. Like anything in the world of crypto, there are numerous opinions why Bitcoin Prices have reclaimed the $5,000 USD level. One popular theory suggests that Bitcoin is leading the cryptocurrencies out of a bear market that began in December of 2017. With a jolt higher from the mid $3,000 USD range, this idea isn’t out of the question. Putting the possibility of a new crypto bull market to one side for a moment, there are some other theories that paint the Bitcoin boom is a less auspicious light. The idea is that a massive order for Bitcoin boosted prices quickly. Comments from another crypto research firm, DataDash, seem to confirm this theory. We have to understand that over the past months, we’ve had a good opportunity for OTC buyers to finally start picking up Bitcoin at these (lower) levels. And once they have enough incentive, once they have enough at stake in Bitcoin markets, once they’ve built up their long term positions, they have an incentive to trade on spot market. Meaning, to clear through the order book to start buying positions on spot market. Why would they do that? Well, it’s because they’ve got a much more substantial position that they bought OTC where they didn’t incur slippage. And now they have an incentive for price to actually have slippage to the upside, to clear through that order book, to buy some extra Bitcoin on an exchange, really across most of the major exchanges, probably around 50,000 or 60,000 Bitcoin, and from there actually increasing the value of their much larger position. And this can happen in crypto markets, whether people think it’s moral or not. I think that’s substantially what’s happening. Market Pump or Bear Market Bottom? There is no way to know if this is the end of the grueling crypto bear market that has been hanging over the sector for more than a year. If the big Bitcoin price pump was just a massive order being shot through a few of the biggest crypto exchanges, it seems unlikely that it would be enough to turn the tides in the crypto market. In some ways, Bitcoin prices are at the mercy of a handful of large holders (whales), which may be why so many people are wary of jumping into the world’s most valuable crypto. Only time will tell if Bitcoin prices are on a steady trend of higher lows, and higher highs.